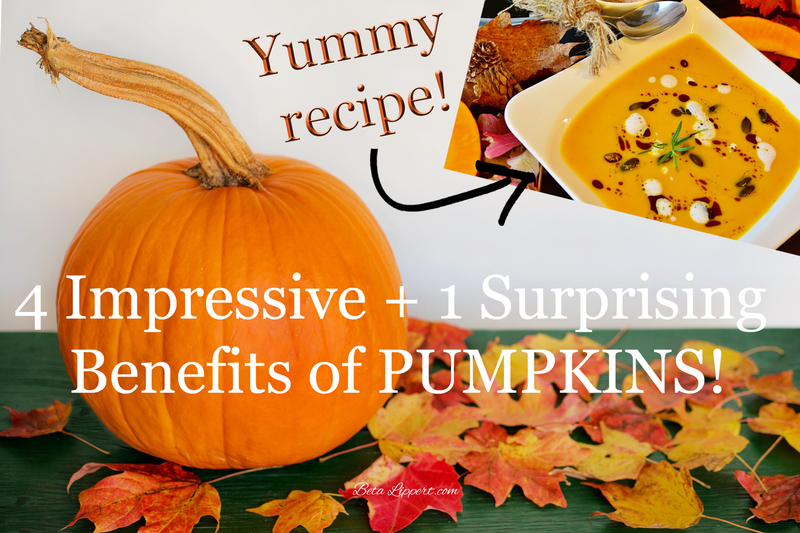 4 Impressive + 1 Surprising Benefits of Pumpkin & A Yummy Recipe! 2. Rich in Vitamin A: A serving of pumpkin has a whopping 200% of our daily recommended intake of Vitamin A. Vitamin A is important to keep our vision, immune system, heart, lungs and kidneys healthy. In addition to Vitamin A, pumpkin has healthy dose of Vitamin C and potassium too! 3. Lowers Blood Pressure: Pumpkin seed oil has been found to reduce high blood pressure. And don’t forget the seeds! Pumpkin seeds contain magnesium which also helps regulate blood pressure. And, they’ve got zinc, calcium, and potassium to boot! So save those seeds when you’re carving pumpkins! 4. Heart Healthy: The plant based chemicals in pumpkins called phytosterols, make it more difficult for our small intestine to absorb cholesterol, thereby lowering the total and LDL (“bad”), cholesterol levels. The fiber in pumpkin also helps keep our hearts healthy! 5. They Make You Happy: My personal favorite benefit from pumpkin, tryptophan! Tryptophan is the well known amino acid responsible for making us sleepy after our Thanksgiving meal. If you have trouble getting to sleep at night then the correct tryptophan dosage can help you get to sleep! In addition to helping us sleep, tryptophan also makes us happy! So there you have it! Five good reasons to eat more pumpkin! As a pumpkin aficionado myself, I absolutely LOVE when autumn rolls around! Pumpkins are every where and in every thing! One staple in our house I hadn’t really tinkered much with with regards to pumpkin, was soup. 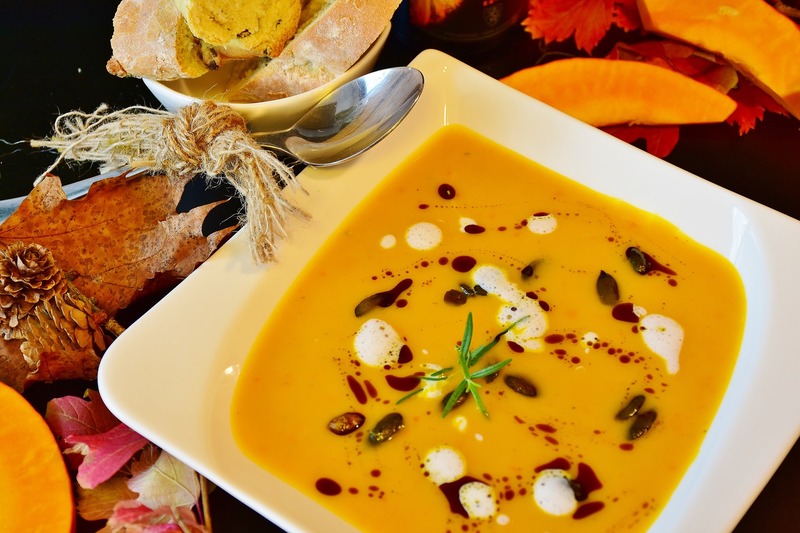 My beans are usually front and center, but they’ll have to take a back seat, while I try out this super simple, pumpkin soup recipe from Mayo Clinic. 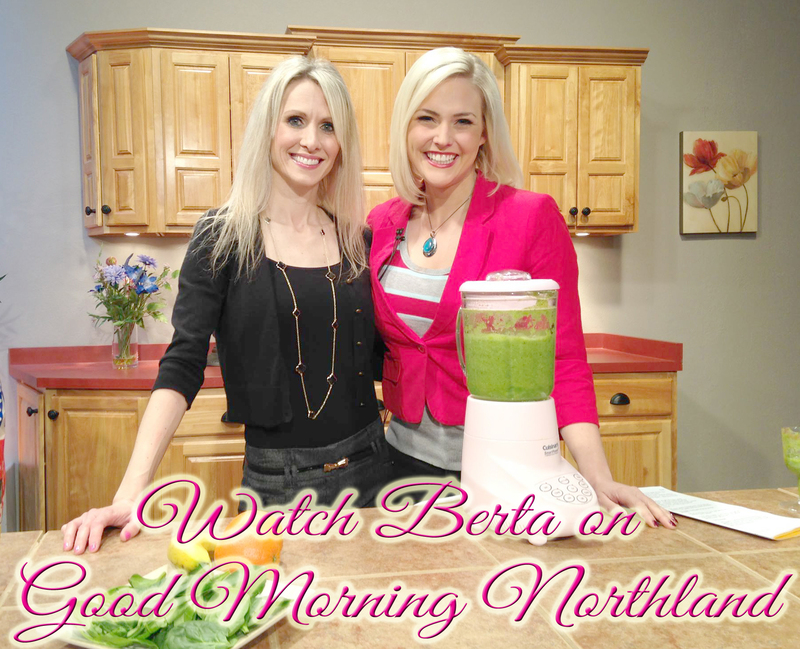 It’s healthy, delicious, and easy to make. An added bonus: It can be on the table in 15 minutes! In a large saucepan, heat 1/4 cup water over medium heat. Add onion and cook until tender, about 3 minutes. Don’t let onion dry out. Add remaining water, pumpkin, broth, cinnamon and nutmeg. Bring to a boil, reduce heat and simmer for 5 minutes. Stir in the milk and cook until hot. Don’t boil. Ladle soup into warmed bowls and garnish with black pepper and green onion tops. Serve immediately.